One bedroom ground floor apartment in Protaras 200 meters to the beach with shared swimming pool. Walking distance to all amenities and suitable for families or couples. Aliki is an amazing brand new one bedroom ground floor apartment on the beautiful resort of Protaras. Is a well furnished and equipped apartment, and able to cater all your accommodation needs. This spacious one bedroom apartment air conditioned throughout is the perfect choice for your holiday in Cyprus. The apartment is situated in a prime location of Protaras, 200 meters from the beach on the ground floor of a small tourist complex. Located less than a minutes walk to the streets filled with shops, bars and restaurants, to suit all tastes and ages. The site hosts tennis court, two outdoor pools and a children's pool that can be used free of charge by our quests. There are also sun loungers that can be used by our quests free of charge. The apartment is fully furnished and equipped with all modern appliances such as TV, DVD player, fridge/freezer, cooker, microwave, toaster, kettle, dishwasher, washing machine, ironing facilities, oven, extractor fan & all cooking utensils. There is toilet and shower room. Free of charge all necessary bed linen and bath towels are provided . On site there are 2 large communal pools, and a children's pool, with sun loungers for your use by our quests free of charge. This complex offers Gym and Spa with extra charge and available from April until November. Extra information The apartment is located in Protaras one of the most attractive resorts of Cyprus. A couple of minutes walk you will find bars, excellent taverns and restaurants, supermarkets, bank, kiosks and car hire rental offices. Larnaca airport is about 40 minutes drive from the apartment. There is a National Park Forest in the area at Cape Greco, occupying an area of 390 hectares and offers facilities for hiking, picnicking, cycling, horse-riding, climbing, swimming and diving. Scenery and views in this area are some of the best on the island. 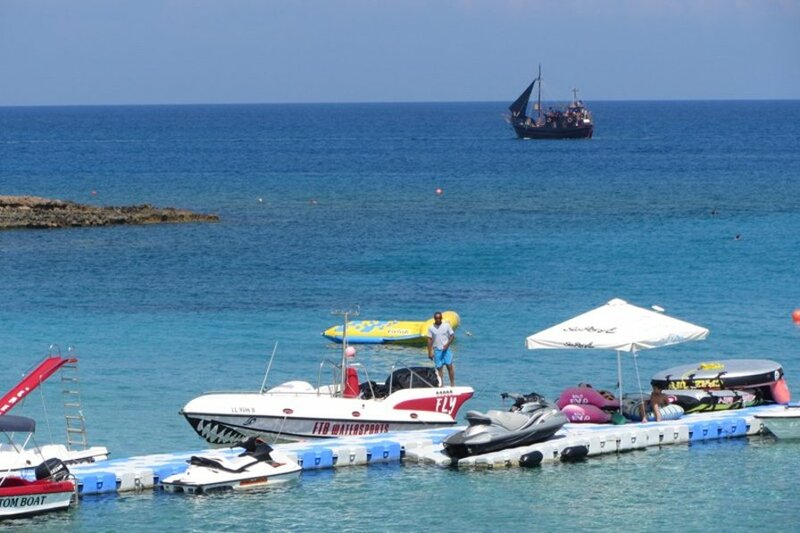 The Protaras coast is a the family friendly coastline resort with its famous white sandy beaches and, in particular, Fig Tree Bay where you can find activities such as snorkeling, jet-skiing, para-sailing plus Water world, where children can splash all day. There is plenty to do for all ages and interests. There are a mini water park 4 km from the apartment and a bigger one in Ayia Napa.